Wondering when you can get a dual-core 1.2GHz Snapdragon smartphone processor to game on the go? Or Optimus-enabled Nvidia chips in your laptop to save battery while traveling? At this year's Computex expo in Taipei, chips are getting smaller, faster, and smarter than ever. The iPad gave quite a jolt to the tablet market, and now several chip manufacturers are rushing to improve their mobile CPU and GPU offerings. Who's jumping on the bandwagon of fast, energy-sipping chips? Intel has a new thermal "technology concept" in the works called "Canoe Lake," which will purportedly allow for thinner laptops in the near future. Canoe Lake will work with Atom chips--which usually require fans to dissipate excess chip heat--to cool future laptops and allow for use of the Atom dual-core technology in netbooks. 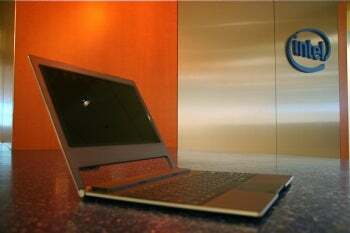 Intel is also expected to announce another chip for the laptop market, the Moorestown version of Atom. The Moorestown flavor of Atom, called "Oak Trail", is a miniaturized version of the Atom platform. It should support 1080p video playback and HDMI, use approximately 50% less power than previous generations of the chip, and support full versions of Windows, not just Windows CE (scaled-down versions of processors often can't run heavier-weight operating systems). We don't quite know what's with the camping theme for Intel names, but we're hopeful that this family of chips means thinner, lighter, and more-energy-efficient laptops not so far down the line. For more on Intel's Atom chips, check out "Intel Talks Technology Concepts, Plans Atom Update." How about GPUs? Nvidia's been talking about its Optimus technology for switchable graphics cards for some time, but at Computex it announced 16 models of laptops from several manufacturers that sport Optimus technology. Optimus allows laptop GPUs to only switch on when dealing with intensive 3D graphics and video (otherwise it uses an integrated GPU), which should cut down on battery usage and heat in laptops that feature this technology. Want more on the latest Nvidia Optimus-enabled laptops? Check out "Nvidia Primes Market for Optimus at Computex." Qualcomm announced two new Snapdragon processors geared for smartphones, each with dual cores and running at up to 1.2GHz. The MSM8260 and MSM8660 should up the processing power of smartphones that use these chips, allowing for playback of 1080p video and screen resolutions at up to 1280 by 800 pixels. For more on the Snapdragon family, read on: Qualcomm Readies 1.2GHz Dual-core Snapdragon Processors for Smartphones. Intel, while tweaking Moorestown chips for laptops, expects the first smartphones running Moorestown to ship at the beginning of next year. Combining an Atom processor and a GPU into a single package, the Moorestown chips should draw less power and provide higher performance than rival processors. What does that mean for you? Playing "World of Warcraft" and watching "Avatar" in HD on your smartphone. Awesome? Yes. Excessive? Probably. Will you want it? Most definitely. Read on for more Moorestown: Intel Expects First Moorestown Phones in Early 2011. Running at speeds of 1.6GHz, a new dual-core x86 processor from Via promises high performance and similar low power consumption to Intel's Core 2 Duo processors. While the release date of this chip is uncertain (probably in the next six months), the Via Nano DC should be on par with tiny low-power dual-core chips from AMD and Intel. Via Shows Dual-core Nano Processor. Has corporate spying tainted the Computex expo? AMD, when announcing its upcoming Fusion processors, was reluctant to provide many details on these low-power chips, much less a photo, due to worries that a high-resolution photo would fall into the hands of Intel. 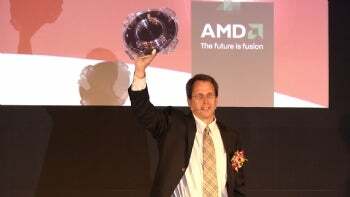 Such a photograph would reveal how many Fusion chips can be produced on a single wafer as well as the manufacturing cost, according to Rick Bergman, senior vice president and general manager of AMD's product group. For more on AMD's Fusion chips, check out: AMD Shields Fusion Demo From Intel's Spies. The take-home message from Computex is that chips for mobile and desktop systems are becoming more powerful while using less energy. By early next year, you'll be able to frag and cast spells to your heart's content from the comfort of anywhere you and your smartphone may go. What chips announced at Computex are you most looking forward to? Let us know in the comments!